Shelby Lynne was born in Quantico, Virginia and raised in Mobile, Alabama where she attended Theodore High School. Music was an important part of the Moorer family. Lynne's father was a heavy drinker who abused his wife. In 1985, her mother fled with the two girls to nearby Mobile, but her father soon discovered their whereabouts. In 1986, in front of 17-year-old Lynne and her younger sister, Allison, he shot his wife to death before taking his own life. Lynne appeared on TNN's country music show Nashville Now in 1987. She soon landed a recording contract with Epic Records. Her first recording for Epic was a duet with George Jones, "If I Could Bottle This Up", which became a top-50 hit in 1988. Epic teamed Lynne with producer Billy Sherrill for her 1989 debut album Sunrise. The follow-up, 1990's Tough All Over, took more of a mainstream country direction, and 1991's Soft Talk found Lynne moving into slick country pop. Lynne placed several songs on the country charts during this period, but none managed to break into the top 20. Critics generally regarded her as a promising talent, and she won the ACM's Top New Female Vocalist in 1990. However, she was tiring of the lack of control she was afforded over her image and musical direction. She split from Epic and signed with the smaller Morgan Creek label, debuting with 1993's Temptation, an exercise in Bob Wills-style Western swing and big band jazz. The label folded not long after, and she moved on to Magnatone for 1995's Restless, which marked a return to contemporary-style country. Afterward, Lynne disappeared from recording for several years. One notable project that she assisted on was Vince Gill's 1996 High Lonesome Sound album, where she provided background, harmony vocals on the song "You And You Alone". Vince Gill and Shelby Lynne performed the song at the 1997 CMA awards show. In 1998, Lynne moved to Palm Springs, California. For her next record, she worked with producer and songwriter Bill Bottrell. The result was the confessional and eclectic pop rock and blues-influenced album I Am Shelby Lynne. "That album came from the most vulnerable, desperate place," she recalled years later. "I think about it every day." Island Def Jam released the album in England during the fall of 1999 and then in the U.S. the following year, to wide critical acclaim. At the 43rd Grammy Awards, held on February 21, 2001, she won the award for Best New Artist. "Thirteen years and six albums to get here," said Lynne during her acceptance speech. One of the songs, "Dreamsome", also appeared on the soundtrack of the film Bridget Jones's Diary. Her 2001 follow-up album Love, Shelby was produced by Glen Ballard and featured a slicker, more pop-influenced sound. The album received mixed reviews. Lynne took a more low-key approach on her next effort. Identity Crisis was self-produced, recorded largely in her home studio and with few additional musicians. Many of the 12 tracks focused on dark themes, but there were also lighter songs such as "One With the Sun" (inspired by a conversation she had with Willie Nelson). The album found a home on Capitol Records and was released in September 2003. The critics gave her high marks; AllMusic's Thom Jurek wrote, "There is no identity crisis here, just the indelible mark of a mature, intense, always engaging artist." Suit Yourself (2005) also received praise from critics. However, neither record was commercially successful. Her album Just a Little Lovin', released in early 2008 by Lost Highway Records, paid tribute to the late British singer Dusty Springfield. The producer was Phil Ramone, who had worked with Springfield on "The Look of Love". Just A Little Lovin' became the highest charting album of Lynne's career, reaching number 41 on the Billboard 200. In a review for Entertainment Weekly, Marc Weingarten wrote that the album "is a stark reminder of Lynne's empathetic skill as an interpreter". The sparse production and extremely well recorded nature of the album, combined with its song selection have made this album a favorite audiophile "demo" recording, and as a result the album has recently been reissued on audiophile-grade 200g vinyl as well as SACD. Following a dispute with Lost Highway, Lynne started her own label, called Everso Records. "I plan on taking advantage of my freedom and working hard and putting out a lot of records," she said in an interview. The first release was her album Tears, Lies and Alibis (2010). She followed up later that year with the holiday album Merry Christmas, featuring such classics as "Christmas Time Is Here" and "O Holy Night". The third and most recent release is Revelation Road (2011), on which she played all the instruments. On August 18, 2017, Lynne released a collaborative record with her sister Allison Moorer titled "Not Dark Yet". Produced by British folk singer Teddy Thompson, it features covers of songs by Merle Haggard, Bob Dylan, Nirvana and The Killers as well as an original recording. Lynne performed the John Lennon song "Mother" at Come Together: A Night for John Lennon's Words and Music in October 2001 and at Theatre Within's 30th annual Lennon tribute in November 2010. She has worked professionally with her sister, Allison Moorer. On Moorer's live album Show, released in 2003, Lynne performed three duets with her sister. Lynne wrote "She Knows Where She Goes", one of the songs featured on Moorer's 2008 album Mockingbird. The two sisters performed five concerts together during what they called the Side by Side tour. The concerts took place from October through December 2010 in San Francisco, New York, Virginia, and Alabama. In 2002, she sang a duet with Raul Malo on his first solo-album Today. The song is titled "Takes Two To Tango". In 2004, Lynne was featured in a duet version of alternative rock band Live's song "Run Away." This rendition can be found on the band's greatest hits compilation Awake: The Best of Live. Also in 2004, she sang a duet entitled "Can't Go Back Home", on Tony Joe White's album "The Heroines". In 2007, she performed background vocals on Marc Cohn's fourth album, Join the Parade. She contributed to Forever Cool, a 2007 album from Capitol/EMI featuring contemporary artists in duets with the late Dean Martin. Alongside Big Bad Voodoo Daddy, Lynne performed a duet of one of Martin's best known tunes, "You're Nobody 'Til Somebody Loves You". She also joined the 9th, 10th, 11th, 12th and in 2015 the 14th annual Independent Music Awards judging panel to assist independent musicians' careers. Lynne has taken on a few acting roles. She portrayed Johnny Cash's mother Carrie in the 2005 film Walk the Line. She appeared in a 2009 episode of the Lifetime drama series Army Wives as a country singer trying to reunite with her son. She played herself in an episode of the Starz comedy series Head Case. She was featured in Live From Daryl's House with Daryl Hall in a "delta blues-meets-Philly soul" throwdown. The show aired on Viacom's Palladia music channel on December 15, 2012. Lynne keeps her personal life private. ^ "Shelby Lynne And Allison Moorer: Musical Sisters". NPR.org. ^ Jurek, Thom (1993). "Shelby Lynne - Temptation review". Allmusic. Retrieved 20 August 2012. ^ Farber, Jim (18 October 2011). "'Revelation Road' review: Shelby Lynne". New York Daily News. Retrieved 20 August 2012. ^ "Shelby Lynne and Allison Moorer: Musical Sisters". NPR. December 15, 2010. ^ Thigpen, David E. (April 24, 2000). "Music: Blows Against The Empire". TIME. ^ Hoerburger, Rob (January 13, 2008). "Shelby Lynne's Dusty Trail". The New York Times. ^ Hilburn, Robert (February 18, 2001). "She Had Such High Hopes". Los Angeles Times. ^ Allen, Jamie (February 22, 2001). "Steely Dan, Faith Hill, Eminem, U2 each win 3 Grammys". CNN. ^ McCall, Michael (September–October 2003). "This year's model". No Depression. Archived from the original on 2012-09-29. ^ Jurek, Thom. "Identity Crisis > Overview". Allmusic. ^ Weingarten, Marc (February 1, 2008). "Just a Little Lovin'". Entertainment Weekly. ^ Marc,Andrei (March 1, 2012). "" Just a Little Lovin' " Finally Gets Some". "Michael Fremer's Music Angle". ^ Graff, Gary (April 23, 2010). "Shelby Lynne Plots Own Course With 'Tears'". Billboard.com. ^ Horowitz, Steve (October 20, 2011). "Shelby Lynne: Revelation Road". PopMatters. ^ "Shelby Lynne and Allison Moorer's Not Dark Yet Arrives Aug. 18". ^ Farber, Jim (November 15, 2010). "John Lennon concert brings out Cyndi Lauper, Patti Smith, Aimee Mann for 30th year at Beacon Theater". NY Daily News. ^ "Lynne, Moorer tour together for first time". Country Standard Time. ^ Specker, Lawrence F. (December 4, 2010). "Lynne, Moorer take Saenger stage 'side by side' at last". Mobile Press-Register. ^ "Independent Music Awards - 9th Annual Judges". Archived from the original on 2011-10-01. 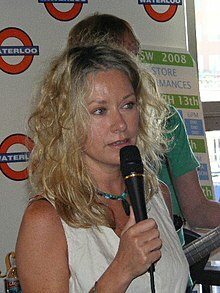 Wikimedia Commons has media related to Shelby Lynne.